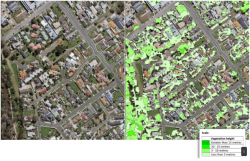 In an Australian first, The Nature Conservancy and partner Resilient Melbourne, are mapping the tress of Metropolitan Melbourne using new satellite imagery and mapping software to better inform city planning. This mapping is an essential element in creating Melbourne's Urban Forest Strategy, which will be released later this year, and also supports the Government of Victoria’s intention to create a metropolitan urban forest, as set out in Plan Melbourne. “With the population of Melbourne expected to double by 2050, there is increasing pressure on space for trees and vegetation, both on public and private lands,” said Toby Kent, Chief Resilience Officer at Resilient Melbourne. Shade from trees provides important cooling for a city that’s getting hotter due to climate change and the increasing cover of concrete, bitumen and roofs. Selection and configuration of trees and shrubs makes a big difference to how native fauna, particularly birds, move through the suburbs, with Research by The Nature Conservancy also demonstrating that trees improve health by reducing instances of diseases such as heart disease, diabetes and depression. To keep up to date with this project, please visit the Nature Conservancy website.